The most challenging day of the 2017 Afriquia Merzouga Rally began today with the start of the Marathon Stage. While riders were initially meant to travel over a distance of 274km, following yesterday's sandstorm, the stage was shortened by 80km. Riders had to grapple with the soft sand of the Erg Rissani region, before heading across tracks that led them up to steep climbs that went up seemingly impossible inclines. The end of the fourth stage sees riders head to the bivouac where they will stay for the night, having to service their own motorcycles with no help from crew members. 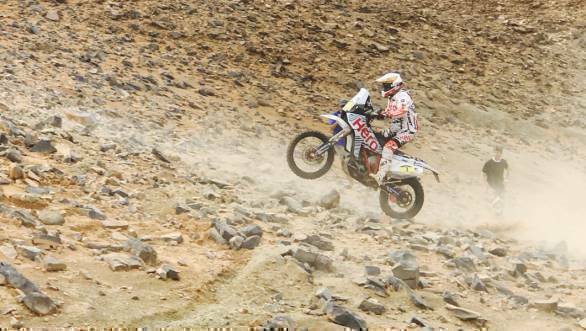 The day began pretty well for Hero MotoSports Team Rally's Portuguese rider, Joaquim 'JRod' Rodrigues. JRod came, saw and conquered, leaving spectators open-mouthed as he pinned the throttle and took his Speedbrain 450 straight up a rocky hillside. Clearly he was determined to recover from a tough outing in Stage 3 (with issues to the bike's cooling system and then the sandstorm). While he completed the stage in fifth place, he was awarded a penalty for missing a way point, which meant he went down to 12th in the stage standings. This moved him down in the overall standings to ninth. Meanwhile CS Santosh performed well in the stage, riding to a 15th position finish. However, his ranking in the overall standings fell to 20th . Wolfgang Fischer, Team manager, Hero MotoSports Team Rally seemed happy with the fact that his two riders had made it through the first part of the marathon stage and had arrived at the marathon bivouac. "They reported to us through satellite phones that it was a tough stage with very challenging navigation and difficult to find hidden way-points. The bikes and the riders are in good condition and we look forward to finishing the second part of the Marathon stage tomorrow," he said.